The political stage is not just heating up, it’s boiling over. We are seeing mob violence push people out of restaurants and disrupt proceedings. And let’s be honest, this isn’t about mere politics. The anger and vitriol that pits left against right is rooted in moral issues; especially with abortion and traditional marriage. The left is not satisfied with being treated respectfully, they are demanding abandonment of our own values and participation in their agendas. But treating people with dignity should not require that we agree with them any more than fighting to save unborn babies does not mean we are at war with women. As we brace for what is ahead, prayer and the sacraments are our shield of protection. We also can call on many intercessors who have gone before us—living their faith amid persecution. For instance, all the Apostles and early Christians dealt with it head on. St. Thomas Moore died a martyr for refusing to go along with King Henry the VIII’s illicit marriage to Anne Boleyn. He did not speak against it but simply refused to sign a document saying he accepted it. St. Maximillian Kolbe and many other Catholic priests died in concentration camps in Nazi Germany during WWII for courageously living faith. A saint who will be canonized on October 14, Blessed Archbishop Óscar Romero is another martyr who died for living his faith amid persecution. He was shot down in his native El Salvador for speaking out against violence and repression during El Salvador's civil war which lasted from 1980 to 1992. Blessed Romero spoke out against the violence during his last homily. "The law of God which says thou shalt not kill must come before any human order to kill. It is high time you recovered your conscience," he said. "I implore you, I beg you, I order you in the name of God: Stop the repression." The next day, on 24 March 1980, he was shot dead celebrating Mass in a hospital chapel. It is believed to be a murder ordered by the U.S. armed right-wing death squad. In honor of his canonization the film, Romero: Collector’s Edition, about his transformation from an apolitical priest to a courageous leader has been made available by Paulist Productions. The movie is an eye opener among those like me with only a cursory understanding of Romero’s martyrdom and volatile society in El Salvador. The Archbishop served everyone, but any person or group opposed to those in power was labeled a communist or terrorist and subjected to neighborhood massacres, kidnapping and murder. Romero preached the truth and against violence on both sides. 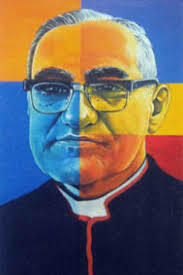 The example of Romero’s courage is especially relevant today where anyone going against the aggressive left, are shouted down, fired, protested and threatened. Let us pray to Blessed Romerofor strength and wisdom to live out our faith.